One day, Rasulullah (saw) was telling his Companions about four of the Children of Isra’il (Bani Isra’il) and how they worshipfully served Allah for eighty years, without disobeying Him for a single twinkling of an eye in all of that time. The four that he spoke of were Sayyidina Ayyub (as), Sayyidina Zakariyya (as), Sayyidina Hizqil (as), and Sayyidina Yusha ibn Noon (as). We have indeed revealed this (Message) in the night of Power. Therein come down the angels and the Spirit by Allah’s permission, on every errand. Peace!… This until the rise of Morn! It is on one of the odd nights of the last ten nights of Ramadhan. The atmosphere is comfortable, neither too hot or too cold. The sky is jet black. No barkings of dogs can be heard. When the sun rises the following morning, it appears as a disc without rays, rather like a copper bowl. 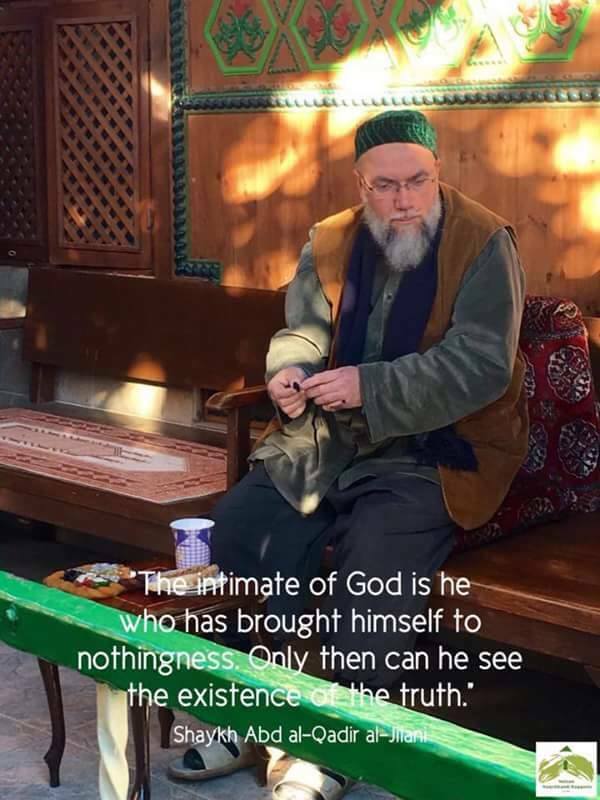 Make intention as follows: nawaitu al-arba’in, nawaitu al-‘uzla, nawaitu al-khalwa, nawaitu l-‘itikaf, nawaitu s-sulook, nawaitu r-riadah lillahi ta’ala fee hazhal masjid. Express the intention to fast the next day. Pray Solatul tasabih (4 raka’ats – done in sets of two). Pray Solatul Witir with Qunoot. Pray 100 raka’ats Solat Sunnat Lailatul Qadr in sets of two. Read Surah al-Ikhlas twice in the 1st raka’at, and once in the 2nd raka’at, after Surah Fatihah. Stay awake all night, reading Qur’an and reciting the awrad. On the following day, it is encouraged to make two sacrifices (Qurban) for the Face of Allah, the Highest, the Almighty, to thank Allah and to amend the shortcomings of our fast. One should offer the sacrifice for the Community of Prophet Muhammad (saw) and for the people of Tariqa, distributing the meat to the poor and needy. Do all the following in congregation if possible. This is the tradition that Maulana Sultan Awliya followed throughout his life. What to do if you meet Lailatul qadr? The Signs that a person is receiving salams from Sayyidina Jibrail (as) that night, is the moistening of the eyes and the softening of the heart. The following prayer is to be done on the night of the last Friday in Ramadhan, it equals a thousand months of worship, it covers all the worship one has missed in one’s lifetime. Sayyidina Abu Bakr Siddiq (ra) said that this was a Sunnat prayer done to atone for all the past prayers that we missed since we were born. It is was equivalent to 400 years of missed past prayers, and Sayyidina Ali (ra) said that it could even be rewarded as 1000 years of missed prayers. When asked what the excess years are for, since we live for only 60+ years, the Prophet (saw) said that it will be used to atone for the missed prayers of our parents and ancestors, as well as for people in our town or village. It is a four raka’at prayer prayed with one tashahud and one salam at the end (the is no tashahud after two raka’ats, just continue from the 2nd to the 3rd raka’at without reading ‘At-tahiyyatul…’. I am praying this sunnah/nafil prayer, as atonement all the prayers I have missed in my lifetime since the day I was born, till this moment. In the each raka’at, recite Surah Fatihah once, and Surah al-Qadr (Surah 97) 15 times then Surah al-Kauthar (Surah 108) 15 times. 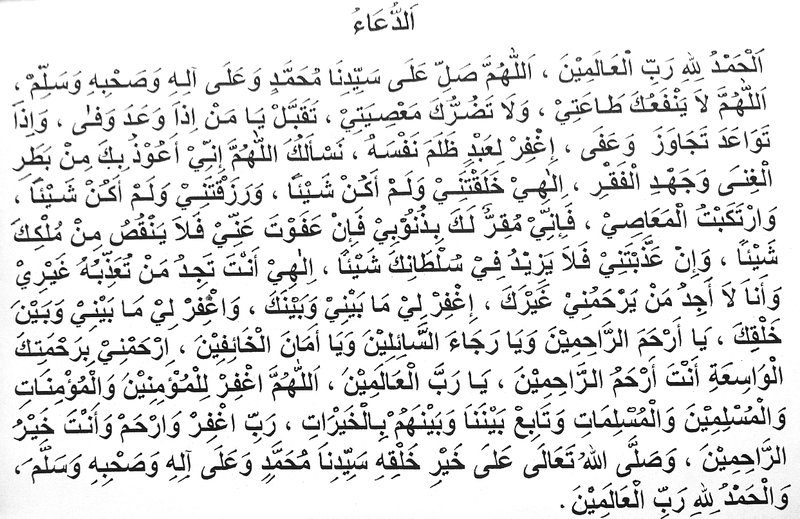 Then recite 100 Selawat/Darood Shareef upon Rasulullah (saw). You may download this do’a for printing, here. You may pray this with an Imam leading, and the jema’ah may choose to read with Imam or just remain silent while concentrating on the Imam’s reading. When the Imam raeds the do’a, the congregation MUST recite Ameen, so that it is as if they too are reading this do’a. They needn’t read it again, if the Imam has already done so. Shaykh Abdul Qadir Jilani (q) teaches another Sunnat prayer, Solat al-Khusama, that is to be done on the last Friday of Ramadhan. In addition to the Sunnat prayer above, this is another special Solat that is done on the last Friday of Ramadhan, usually between Juma’at prayers and asar. It is a 4 raka’at prayer, done at one go with one salam at the end, that is done, so that the reward of it is donated to all people whom you have harmed and sinned against, so that Allah will use the reward to satisfy their claims on the Day of Resurrection, if He so wills.